This new edition gives students all the tools they need to succeed on the new TOEFL® iBT integrated-skills test. 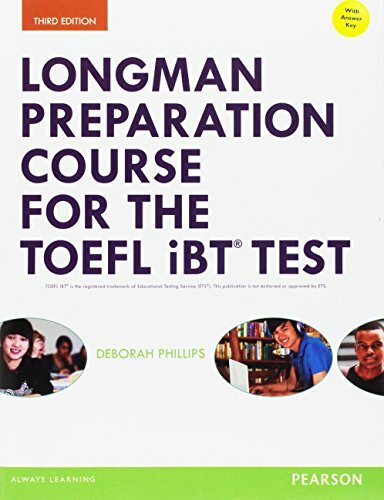 Providing both a comprehensive language-skills course and a wealth of practice for all sections of the test, the Longman Preparation Course for the TOEFL iBT® Test, Third Edition is appropriate for courses in TOEFL test preparation or as a supplement to more general ESL courses. New guidelines and strategies for note-taking. New tips and hints throughout the practice sections. Downloadable audio program and teacher’s materials, including lesson plans and classroom activities. Access to MyEnglishLab: TOEFL: the easy-to-use online learning program, with extensive additional practice activities, pre- and post-tests, and three full-length tests. Updated material for all the new types of test passages and questions. Listening provides authentic conversations in an academic setting and academic lectures with new questions about a speaker’s attitude or purpose. Writing consists of writing and expository tasks. Eight Mini-Tests that preview the test’s integrated four-skills format. Two complete Practice Tests that familiarize students with the actual test format, including length and level of difficulty.